tv: They never really get our accent right! That last one is so true that I almost get mad when I see that we’ve stolen yet another show. Except for ‘Hole in the Wall,’ that was taken from the Japanese. Now I really enjoyed ‘Little Britain,’ though the characters can wear on you after a while because they make any sketch a pre-determined premise. You know how it’s going to end, but you still watch because you’re hoping it will be funny. The original plan with ‘Little Britain’ being imported was to find American analogues so that it would be a show poking fun at Americans. But it looks like the only Brit we like to watch making fun of us is Tracey Ullman. 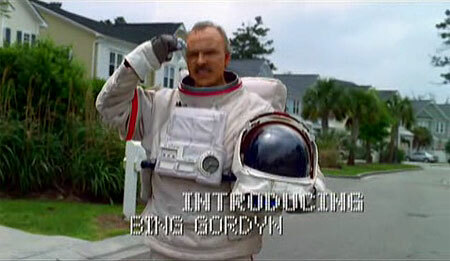 So they’re putting the British characters into American situations, similar to their holiday episode ‘Little Britain Abroad.’ Vicky Pollard in a camp for juvenile offenders, Lou and Andy on holiday and a new character Bing Gordyn, former astronaut. I’m not so fond of that last one because as much as I love the Brits, their American accents never sound right. They’re either forced or mocking, like whenever Monty Python’s Graham Chapman would imitate an American, he’d adopt an overblown Texas accent. Still, I’m sure the series will be funny, I just don’t know if it will be a success. It reminds me of all the hub-bub over Roseanne trying to create an American version of ‘Absolutely Fabulous’–it never happened. Apparently they had a hard time getting even HBO to approve a show where two female protagonists drink too much, smoke too much, do too many drugs and are generally awful to everyone around them, including each other. Then the two ‘mos writing ‘Will and Grace’ combined Patsy and Edina into a single character with more style and no one had a problem with Karen Walker. I don’t even watch the show and I love her! As it turns out, I’d never even seen Saunders and Lumley’s appearance on ‘Roseanne’ before… until yesterday! While this may be the first time we’ve actually see Edina do work, I’m not sure I care for her trying to squeeze money out of someone in the name of PR. The recycled jokes and outfits work, but it’s a good thing they were a one-shot cameo. Next story It’s health food. MENTAL health food. Ugh. I agree with you about the English trying to “do” American (and they probably feel the same way about Americans trying to do an English accesnt), but speaking as a southerner, there is NOTHING worse that hearing someone trying to put on a southern accent. They always overdo it. Not to mention the fact that the southerner is always portrayed as the idiot in the crowd. @Gilahi: While I was raised in the south, my family doesn’t really have much of an accent. Plus bringing myself up on BBC shows via PBS pretty much eradicated mine, however when I get to a certain level of inebriation… the South rises again.